30 Day Money Back Guarantee - Our Money-Back Guarantee policy ensures your satisfaction. If the Technical Support Gurus could not perform in accordance to service specifications (read our terms and conditions for more details) and you're not completely happy with the service you've purchased, you can get a full refund within 30 days of initial registration. Service Description - GuruAid's Certified Technicians can help with a variety of problems that you may be encountering. Our services are not just limited to troubleshooting your computer's hardware and software issues. But we also carry in-depth analysis of the computer to ensure it gives optimal performance. a) Single Incident Plan (SIP) - An SIP covers service for only specific problems as discussed on a call. You can call us again within the 30-day period if the original problem/problems are not fixed. 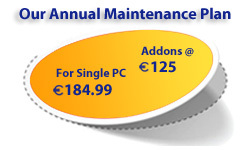 b) Annual Maintenance Plan (AMP) - AMP's offer unlimited access to GuruAid’s technical support team. You can call us as many times as needed. But the support is restricted to the computer for which the AMP is purchased. One division is focused on providing outsourced traditional and digital marketing services to US trade magazine publishers, information services companies, and non-profit organizations. The second division, GuruAid, helps consumers and businesses with technical support service. Customers are provided assistance in installing, configuring, using, and troubleshooting a broad range of IT products and service. This Division was launched in late 2009 and is growing rapidly. The service is currently offered in US, Canada, United Kingdom, Ireland, and Australia. On a daily basis, more than 5,000 subscribers and new prospects seek help from GuruAid’s technical support organization. Lester Inc has more than 800 employees worldwide across its facilities in the US and India. GuruAid builds awareness of its service through extensive use of internet marketing. Prospects, in need of technical support service, become aware of GuruAid through this marketing effort. Prospects in need of technical help call GuruAid on one of its toll free numbers. GuruAid does not make cold calls to prospect customers. GuruAid’s technical sales team (handles these inbound customer inquiries) first determines if the technical problem can be fixed. In the event the problem can be fixed, preliminary diagnostic is performed to narrow down the root cause of the problem. The prospect is educated on the different plans and the value-proposition of the service. Customers who decide to purchase the service are directed to the payment page (https://www.guruaid.com/payment/pay.php). Customers enter the card and other information needed to process the transaction (This info is not visible/audible to GuruAid reps). GuruAid technicians then fix the problem. In case issue cannot be resolved, the transaction is reversed. During the 5 day post sale period GuruAid initiates an outbound customer satisfaction call (Technical issue is fixed and customer happy). GuruAid currently does not auto-renew customers. Customers who want to renew the service, are directed to the payment page, and reenter the card information for the transaction. Remote Access Policy - This policy educates customers on how to launch and control a remote diagnostic or troubleshooting session. The 'Remote Access Policy' can be accessed by clicking here. User Safety Policy - This policy educates customers on the guidelines GuruAid advisor follow during a remote diagnostic or troubleshooting session. The 'User Safety Policy' can be accessed by clicking here.